Is this the face of a terrorist?! We've been remiss in covering anything regarding a controversial screening at the U.N. (more on that here) or, well, pretty much any recent news that is related to Julian Schnabel's new film Miral, starring the lovely Freida Pinto in a powerful role. The film is gaining more buzz because of that controversy and some odd marketing, like the official poster which includes that "face of a terrorist" tagline on it. 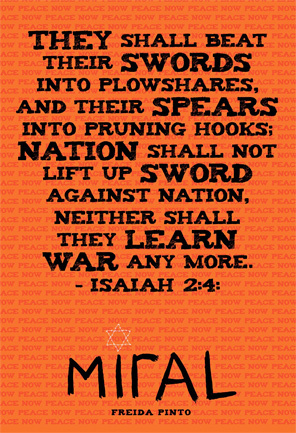 Cinema Blend has debuted two new posters containing a bible verse referring to two nations no longer being at war. It's a very unique and bold set of posters that I wanted to post about, so check them out. You can click either poster to see them in full-size. We also featured the official trailer for Miral in February. Miral tells the story of four women whose lives intertwine in a starkly human search for justice, hope and reconciliation amid a world overshadowed by conflict, rage and war. A chronicle of Hind Husseini's effort to build an orphanage in Jerusalem after the 1948 partition of Palestine and creation of the state of Israel. Miral is directed by artist/filmmaker Julian Schnabel, of acclaimed films Basquiat, Before Night Falls and Oscar nominated The Diving Bell and the Butterfly previously. 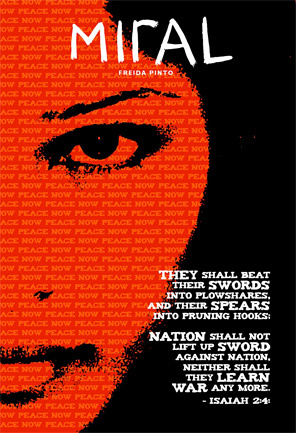 The screenplay was written by Rula Jebreal, who also wrote the book that it's based on. After being delayed from last year, The Weinstein Company has finally set a March 25th release date for Miral, but expect a very limited opening. Anyone interested in it? Actually, I would have been very happy if you had not featured this slanted piece of propoganda any further. I think anyone can be a terrorist, it's a just a case of personal situations and persuasion. I've met people who looked just like me who had blown up and shot people, they weren't as good looking as Freida Pinto however and I didn't stay in their company for very long for obvious reasons. Human beings just like division, they also feel empowered by killing each other, even if only for a brief time it makes them feel big. It will never change. Once I had a friend who really got off on beating folk up, he once told me a story of a guy he'd kicked to the ground and got stuck under a fence leaving him unable to move or get away, he jumped on his head quite a few times and said it gave him the greatest feeling of empowerment. Later that same guy caught up with said friend and jumped on his head in a similar manner splitting his jawbone in half, which required surgery and lots of metal to set right. This is human behaviour, making films about it doesn't change the fact that we love destroying each other.